After 21 years of writing Cork Talk (more on this soon! ), I like to think, at least, that I may have made a positive contribution to the Spanish wine world. About 100,000 possible readers, at its height 150,000+, with more online, reading an average of approximately 800 words per article is, I think, not to be sneezed at! I hope I’ve turned people on to the attractions of wines from Spain, imbuing, perhaps some, with a passion similar to mine. However, if, when I finally arrive at the great bodega in the sky, I am remembered for only two things, I hope it will be for my unerring support of Cava and, more recently, for starting the Orange Wine ball rolling, amongst expats as well as the wider community! The reds of Spain have a history, a present and a future of great success, for sure. I’ve supported and praised them as well, of course, including highlighting lesser know areas of production. The whites have perhaps needed a little more promotion, which I’ve been happy to do, along with an increasing number of other writers, also charmed by their development. Rosado has always been popular in Spain, as well as with those from other countries now living here, or visiting often. Amber or Orange Wine is the new kid on the block, but they’ve certainly, and easily won me over (please see www.colinharknessonwine.com click Articles and scroll down a little to my first article on Orange wines). I’m convinced that even in conservative Spain (wine world wise) we will see an extra category added to their wine lists, eventually, as Manuel would say! However, my support of this ancient, though modern day phenomenon is but a tiny drop in an enormous qvevri of promotion and education, compared to the Amber Wine Ambassador, Simon J. Woolf, whose just published book, Amber Revolution (available here www.themorningclaret.com/shop), I’ve greatly enjoyed reading. If you are looking for a Christmas Present for your wine loving partner (or for yourself, of course) this will be an excellent fit! Of course, it defines Amber or Orange wines (both terms can be used, though I prefer the former, so there’s no confusion, as such wines are nothing to do with oranges! ), how they are made, etc, and very interesting it is too. But this work is also like the history book we would all have loved to have read when we were younger. It gives you the big picture, whilst also going into such fine detail that the reader starts to develop a relationship with the modern day protagonists of this 6,000 years old (at least) craft. It engages with the struggles of the first ever Amber Wine makers, as well as those of this century’s exponents and today’s. And struggles there have been! Amber wines were first made, it is believed, in Georgia. Over millennia the practise spread, though mostly in other Eastern European states. Enter two world wars and the redrawing of borders, part of the spoils enjoyed by the victors! Consider also the rise of Communism in this area, its eventual fall, and the enduring Russia. Chapter titles such as ‘Destruction and Persecution’, give the reader and insight into what’s in store! Simon J. Woolf meticulously tells the history, from the broad perspective, as well as the personal, where, for example, after a NATO led bombing of an area, one of the 20th Century’s pioneering Amber Wine makers felt unable to speak to his friend and similarly passionate equivalent in a nearby country, for years. However, this is far from a depressing book. It’s inspiring. Think about so many obstacles being eventually overcome, and read how they were. Indeed, the book’s front cover gives an idea as to its overall positivity, where it states, ‘How the World Learned to Love Orange Wine’! And, on the same subject look at the last, what quarter, of the book where you’ll see listed so many current practitioners in so many different countries and both of the world’s hemispheres! The photography, by Ryan Opaz, is simultaneously stunning and evocative. We can ‘feel’ the frustration of Amber Wine makers whose hands were tied, perhaps literally in some cases, during the Communist era. I also felt the loss and devastation involved when looking at a black and white photo of Oslavia, destroyed in 1916 as Austro Hungarian and Italian forces battled it out. But we can also sense the anticipation as an Amber Wine is poured by the proud maker, for Simon to taste. We can connect with the ancient world through seemingly being able to touch the iconic qvevri, the huge clay pots, buried underground, in which fermentation so often takes place. And we can ‘smell’ the old oak barrels and foudres where Amber wines are also made and/or aged. Plus, here’s the bonus. There are seven Spanish Amber Wine producers listed, and whose wines are described, here in Spain. In fact, when Pepe Mendoza’s soon to be released wine is on the market, there will be eight, three of them in the Valencia Community! 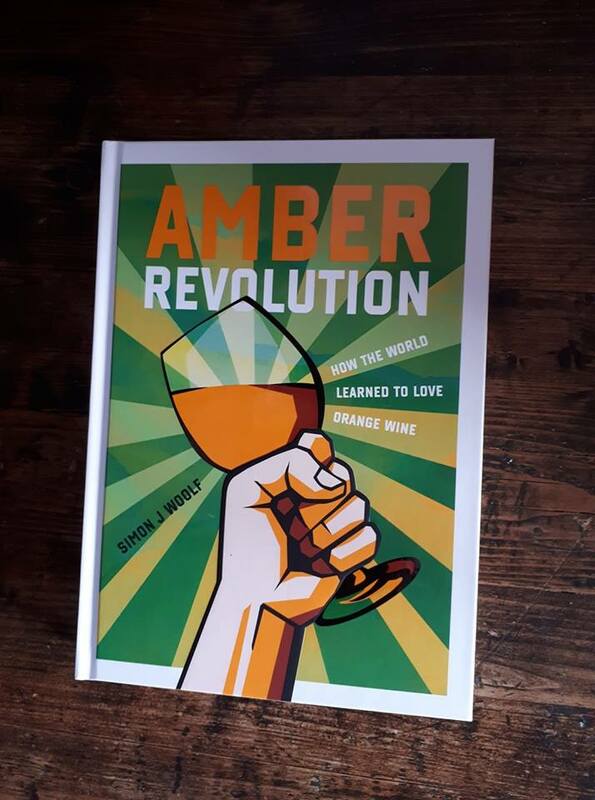 Amber Revolution is a great read, especially with a glass of Orange wine to hand! Previous Previous post: Following Part Thirteen of my blog, A Season in the Life of a Vine! Next Next post: First in the series of wine tastings for small Groups from Sweden!